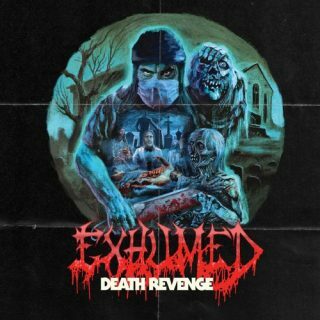 Exhumed : Death Revenge album download | Has it Leaked? Dig in! Exhumed are ready to emerge from the studio with their sixth original studio album, a new disc they've titled Death Revenge. And, to further entice you, the band has also unleashed a new song called "Defenders of the Grave" that you can hear in the player above. As you can hear, it's an aggressive, in your face, brutal rocker, with killer low end from bassist Ross Sewage, rapid fire drumming from Michael Hamilton, forceful guitars and guttural vocals from Matthew Harvey and Michael "Bud" Burke commanding your attention. The song is part of what will be Exhumed's first ever concept album, with the band sharing the dark tale of a series of brutal murders that took place in the late 1820s in Edinburgh, Scotland. The victims cadavers were sold to anatomists amid the underground trade of grave robbery. Matt Harvey says, "We're very excited to see this record come out. It's been a long time since we've f--ked up your stereos! I think this record has a darker vibe than the last two, with a pretty gnarly tale of grave-robbery, dissection, murder, and all sorts of general skullduggery. We dig it and we hope you filthy animals will too." The band recorded their latest album with producer Jarrett Pritchard, taking listeners to new depths both conceptually and musically. Check out the track listing and the Orion Landau-created cover art for the disc below. A trailer for the album can also be viewed below. Exhumed's Death Revenge will be released via Relapse Records on Oct. 13 and you can pre-order the set in digital and physical formats via Relapse or check out the Bandcamp pre-order. At present, the band has yet to book a tour, but they will be performing at Ozzfest Meets Knotfest in San Bernardino, Calif. on Nov. 5.